Mark Spitz is a former competitive swimmer who won nine Olympic gold medals, plus silver and a bronze, five Pan American Gold Medals, 31 US Amateur Athletic Union titles and eight U.S. National Collegiate Athletic Association titles. 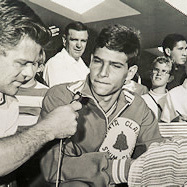 Spitz attended Santa Clara High School and was coached by George F. Haines with the Santa Clara Swim Club. While at Santa Clara High School, he held national high school records in every stroke and in every distance. He also set 33 world records. He is best known for winning seven gold medals at the 1972 Munich Olympic Games, an achievement surpassed by Michael Phelps who won eight golds at the 2008 Olympics. Canadian professional basketball player who plays point guard for the Phoenix Suns of the National Basketball Association (NBA). Nash enjoyed a successful high-school basketball career, and he was eventually given a scholarship by Santa Clara University (SCU). 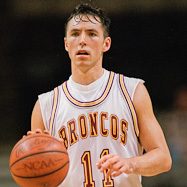 In his four seasons with the Broncos, the team made three NCAA Tournament appearances, and Nash was twice named the West Coast Conference Player of the Year. He is SCU’s all-time leader in assists, free-throw percentage, and made and attempted three-point shots. Nash was essential in the Broncos’ upset of No. 2 Arizona in the 1992-93 NCAA Tournament. He is also the first SCU student-athlete to have his jersey retired. After graduating from SCU, Nash entered the 1996 NBA Draft and was selected as the 15th pick by the Phoenix Suns. Named by ESPN in 2006 as the ninth greatest point guard of all time, Nash has led the league in assists and free-throw percentage at various points in his career. He is also ranked as one of the top players in NBA league history for three-point shooting, free-throw shooting, total assists and assists per game. Brent Jones is a former All-Pro NFL tight end who won three Super Bowls with the San Francisco 49ers. Brent attended Santa Clara University (SCU) where he was a three time All-Western Football Conference selection. As a senior, he was also selected as an All-American by the Associated Press, Football News, and Kodak. He was inducted into the College Football Hall of Fame in 2002. 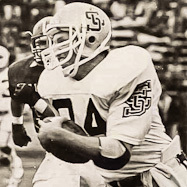 During his college career, he broke Doug Cosbie’s tight end records in Santa Clara, amassing 137 receptions, 2,267 receiving yards, 16.5 yards per reception and 24 touchdowns. Carney Lansford is a former Major League Baseball All-Star and World Series Champion who played for the California Angels, Boston Red Sox, and Oakland A’s. He is currently the Colorado Rockies hitting coach. Lansford started his baseball career in Santa Clara, first playing for the Briarwood Little League team, which made it to the finals of the 1969 Little League World Series. Carney is one of less than a dozen men who have played in both the Little League World Series and the MLB World Series. He is the namesake of Wilcox High School’s baseball field, where he attended high school. In his 15-year career, Lansford was a .290 hitter with 151 home runs, 874 RBI, and 224 stolen bases in 1862 games. Chastain is best known for her game-winning penalty shootout kick against China in the 1999 FIFA Women’s World Cup final and her bra-baring celebration afterwards. While at Santa Clara University (SCU), Chastain lead the Broncos to two Final Four NCAA appearances, 1989 and 1990, before she graduated in 1991. Chastain was a member of the U.S. Women’s National Team from 1988-2004 and won two World Cups and three Olympic medals (two gold, one silver). 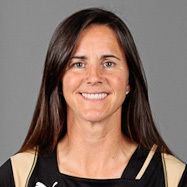 She also was a member of the two women’s professional soccer teams in the Bay Area, the WUSA-champion Bay Area/San Jose CyberRays and the WPS’ FC Gold Pride. Chastain’s husband, Jerry Smith, is the current and long-time head coach of the Broncos while Chastain serves as an assistant coach.